Yesterday Egyptian military strongman Abdel Fattah Al-Sisi announced on Twitter that the Rafah border crossing to Gaza would remain open throughout the entire month of Ramadan. Al-Sisi’s tweet came at the end of a long and bloody week for Palestinians. On Monday, as Ivanka Trump and Jared Kushner inaugurated the American embassy in Jerusalem, Israeli forces massacred 62 Palestinians and injured over 3,000. The youngest victim was an eight-month-old baby girl, Layla Al-Ghandoor. Al-Sisi’s goodwill promise to “alleviate the burdens of our brothers in Gaza” during the Muslim holy month will be believed by few who see his actions against Palestinians living in the Gaza Strip as less than brotherly. Since Israel imposed the 2007 siege on Gaza Egypt has collaborated with Tel Aviv to keep entry and exit points under lock and key. Despite the cautious optimism inspired by the Arab Spring, when Palestinians hoped that with Mubarak’s collapse restrictions on Gaza would crumble, under Al-Sisi relations with the Strip have become progressively worse. This has been done with his full knowledge that the Rafah crossing is a vital lifeline for Palestinians in Gaza – the only other crossing, Erez, is manned by the Israeli army and only Palestinians with special permits and internationals are allowed to pass through. In October 2014 Egypt accused Hamas of a string of deadly terror attacks aimed at Egyptian security forces in the Sinai Peninsula and used this as a pretext to tighten its noose. This was sealed with the designation of Hamas as a terrorist organisation, regular accusations that they are carrying out attacks through the tunnels and a pledge to arrest any member found in the country. Al-Sisi has framed this within the context of his “war on terror”. Since his rise to power he has been on a mission to stamp out terrorism in the impoverished Sinai region which borders Gaza, and in the process armed forces have killed hundreds of civilians, razed their homes and farms to the ground and extrajudicially executed children then framed them as terrorists. Palestinians in Gaza have felt this collective punishment acutely. In 2015 the crossing was open for 32 days in total; in 2016 for 41 days and in 2017 – the worst year for people living on the Strip – for just 29 days. As a result thousands of people seeking medical care, students who have been granted places at universities abroad and families trying to reunite wait endlessly for permission to leave. As the dead and wounded poured into Shifa hospital on Monday, health services in Gaza already suffering from a lack of equipment and essential medicine struggled to cope. The Palestinian Ministry of Health appealed to “sister Egypt” to supply hospitals in Gaza with medicine and send through surgeons and medical crews specialising in vascular surgery and anaesthesia and transfer the wounded to hospitals in Egypt. It was Turkey who responded to this call, but when the aircraft arrived to transport the injured, Egyptian authorities blocked them from landing in their airports. Such is their utter disdain for Palestinian lives. It’s not the first time Egypt has flexed its muscles to stop medical care and workers entering the Strip. Dr. Tarek Loubani was trying to stop the bleeding of wounded protesters, marked clearly as a doctor, on Monday when he was shot in both legs by Israeli forces. In 2013 Loubani was on his way to Gaza from Egypt when he was arrested and detained for 53 days after treating a wounded protester, along with filmmaker John Greyson. On Wednesday, in his first public comments on the Nakba Day deaths, Al-Sisi issued a bland statement urging Israelis to “understand” the reactions of the Palestinians and to “take care” of Palestinian lives. His comments stand in stark contrast with other world leaders who have condemned the atrocities, such as Labour leader Jeremy Corbyn who described the deaths as “slaughter” and Desmond Tutu as a “massacre”. Bolivian Ambassador to the UN Sacha Sergio Llorenty Soliz asked Palestine for forgiveness for the international body’s failure to end the 11-year inhumane blockade on Gaza and the UN Rapporteur on Palestine described the killing of demonstratorsas a “war crime”. As Palestinians mourned their dead the day after the massacre, a number of Israeli newspapers gave credit to Egypt for persuading Hamas to scale down the protests in return for easing the blockade during a meeting on Sunday between a Palestinian delegation and top Egyptian security officials. Member of Hamas’ Political Bureau Mahmoud Al-Zahar has denied that there is any such agreement and reiterated that these newspaper reports are an attempt to break the confidence between the leadership in Gaza and its people. Egypt has traditionally played the role of mediator in conflicts between Israel and Palestine, but Al-Sisi’s proximity to the Israeli government and the actions he has taken against Palestinians in Gaza means he is neither a credible nor an honest broker. Since the Great March of Return protests began on 30 March 116 Palestinians have been killed by live fire – it has taken the tragic deaths of an immense number of men, women and children to get a promise from Egypt to loosen the blockade for just a month. If Al-Sisi fulfils his pledge it will be the longest, consecutive period of time the crossing has stayed open in years. But Palestinians in Gaza are not holding their breath for a man who has delivered nothing but broken promises and misery. A Palestinian child was injured on Thursday evening in a hit-and-run attack by an Israeli settler driving in Hawara town, south of Nablus. Activist Ghassan Daghlas said an Israeli settler rammed his car into 10-year-old Ayman Oudeh in Hawara and ran away, leaving the child bleeding. The child was evacuated to a local hospital so as to be treated for the moderate wounds sustained in the attack. Israeli forces continued to use appallingly lethal force against Palestinian peaceful protestors in the Gaza Strip. In another bloody week, 46 Palestinian civilians, including 7 children and a wheelchair-bound man, were killed. 2024 Palestinian civilians, including 328 children, 74 women, 20 journalists and 5 paramedics, were wounded. 62 Palestinian civilians, including 5 children and 2 women, were wounded in the West Bank. Israeli warplanes targeted an agricultural land in the northern Gaza Strip, and many border control checkpoints. However, no casualties were reported. 123 civilians, including 13 children and 3 women, were arrested. 52 of them were arrested in Jerusalem. 5 Palestinian civilians, including a child, were arrested at the military checkpoints in the West Bank. Israeli violations of international law and international humanitarian law in the oPt continued during the reporting period (10 – 16 May 2018). Israeli forces continued to use excessive lethal force against Palestinian civilians, who participated in peaceful demonstrations organized within the activities of the “Great March of Return and Breaking the Siege” in the Gaza Strip, which witnessed peaceful demonstrations along the eastern and northern Gaza Strip border area. On Monday, 14 May 2018, on the eve of the 70th anniversary of the Palestinian Nakbah, the Gaza Strip witnessed the activities of the Great March of Return early declared by the Supreme Authority of the Return, and ten thousands of Palestinian defenseless civilians participated, including women, young men, children and elderlies. On that day, the Israeli forces excessively and appallingly used lethal force against the peaceful protesters. As a result, dozens of Palestinian civilians were killed while hundreds were wounded; many of them sustained serious wounds, including a PCHR’s volunteer fieldworker. During the reporting period, the Israeli forces killed 46 Palestinian civilians, including 7 children and a wheelchair-bound man. Moreover, they wounded 2,024 Palestinian civilians, including 328 children, 74 women, 20 journalists and 5 paramedics; 135 of those wounded are in serious condition. In the West Bank, the Israeli forces wounded 62 Palestinian civilians, including 5 children, 2 women and 2 journalists, in separate incidents. In addition to the abovementioned injuries, During the reporting period, 51 other civilians, including 4 children, 2 women and 2 journalists, were wounded after the Israeli forces opened fire at them and fired tear gas canisters directly during peaceful protests and stone-throwing at the Israeli soldiers stationed at the entrances to the Palestinian communities in the West Bank. Those demonstrations came in the light of demonstrations organized by Palestinian civilians in protest at Trump’s decision to recognize Jerusalem as the capital of Israel, the Israeli forces’ ongoing settlement crimes, confiscation of Palestinian lands, and Israeli forces’ crimes against the peaceful demonstrations organized by the Palestinians along the eastern borders of the Gaza Strip. As part of the Israeli settlers’ attacks against Palestinian civilians and property, on 13 May 2018, hundreds of settlers raided al-Aqsa Mosque in the Old City of East Jerusalem and performed mass prayers. They then sang and danced in circles and raised the Israeli flag amidst Israel forces’ attacking the Islamic Endowments “Awqaf” officers and tightening on the mosque. The Islamic Endowments Department said that 1,042 settlers raided al-Aqsa Mosque during the morning raids via al-Magharbah Gate while the Israeli forces, police and senior officers intensively deployed in the mosque yards. It should be noted that the Israeli alleged Temple Institutions called their supporters for wide participation in mass raids of the mosque in coincidence with the commutation of the city’s occupation according to the Hebrew calendar. In the afternoon, thousands of Israelis participated in the annual “Flag Dance March” amidst Israeli tightened security measures isolating Jerusalem’s Old City, several neighborhoods and streets to secure the March. The settlers made their way from West Jerusalem streets passing by Hebron Gate and New Gate and then to Jerusalem’s Old neighborhoods via the Damascus Gate until they reached the Western Wall “Buraq”. Groups of them marched towards the Herod’s Gate, Sultan Suleiman Street, and the Lions’ Gate passing via Silwan village until they reached the Western Wall “Buraq”., where the rituals and celebrations of “Jerusalem Unification Day” were held. At approximately 02:00, Israeli soldiers moved into Maithaloun village, southeast of Jenin. They raided and searched a house belonging to ‘Obaidah Ibrahim Na’irat (21) and then arrested him. At approximately 04:30, the Israeli forces withdrew from the village. Around the same time, Israeli forces moved into al-Nabi Saleh village, northwest of Ramallah. They raided and searched a house belonging to Basel al-Tamimi and then arrested his son Wa’ad (17). Around the same time, Israeli forces moved into Beit Fajjar village, south of Bethlehem. They raided and searched a number of houses and then arrested Mohammed Motee’a Thawabtah (20), Mohanned Ahmed Mousa Taqatqa (20) and Ahmed Mahmoud Ismail Taqatqa (23). At approximately 02:30, Israeli forces moved into ‘Aqaba village, north of Tubas. They raided and searched a house belonging to Ahmed ‘Emad Abu ‘Arrah (22) and then arrested him. At approximately 04:00, the Israeli forces withdrew from the village. At approximately 03:30, Israeli forces moved into ‘Ein al-Sultan refugee camp, west of Jericho. They raided and searched a number of houses and then arrested Ahmed ‘Ali Weshah (26). At approximately 04:00, Israeli forces moved into Beit Jala and stationed in al-Sahel neighbourhood in the center of the city. They raided and searched a house belonging to Mahmoud Anas ‘Awadallah (27) and then arrested him. At approximately 10:00, Israeli soldiers stationed behind the border fence between the Gaza Strip and Israel, opened fire at the landfill area, east of Deir al-Balah near the border fence. The shooting sporadically continued for 20 minutes. As a result, the workers in the landfill and those who gather plastic left the area, but no casualties were reported. At approximately 10:20, Israeli soldiers stationed behind the border fence between the Gaza Strip and Israel, opened fire at Palestinian farmers and shepherds, east of al-Buraij. As a result, they were forced to leave the area, but no casualties were reported. At approximately 23:40, Israeli forces moved into Nablus from many entrances and stationed in the eastern side to secure hundreds of Israeli settlers, including Ministers and senior Rabbis, who arrived via dozens of busses to the Joseph’s Tomb in order to perform their rituals and Talmudic prayers. Dozens of children and young men gathered, set fire to tires, put barricades to streets and threw stones at Israeli forces. The Israeli fired live bullets, rubber-coated metal bullets and tear gas canisters at them. As a result, 6 protestors were wounded. A 17-year-old child was hit with a live bullet to the left hand while the 5 others were hit with rubber bullets. Note: During the aforementioned day, Israeli forces conducted (10) incursions in the following areas and no arrests were reported: Jenin refugee camp, west of Jenin; ‘Alar, Saida, Nazelt ‘Essa, Nazlet Abu al-Nar and al-Nazlah al-Gharbiyah villages, north of Tulkarm; Dura, Ethna, Beit ‘Amrah and al-Majd villages in Hebron. At approximately 01:00, Israeli forces moved into Beit Ummer village, north of Hebron and stationed in al-Tarbiqah neighbourhood. They raided and searched a house belonging to Ibrahim Ehmeid Abu Maria (66) and then handed a summons to his son Feras (28) to refer to the Israeli Intelligence Service in “Gush Etzion” settlement complex, south of Bethlehem. At approximately 01:30, Israeli forces moved into ‘Azzoun village, east of Qalqiliyah. They raided and searched a number of houses and then arrested ‘Othman Samir Shalou (28), Samir Mahmoud Shabita (24) and Abdullah Mustafa Redwan (20). At approximately 03:30, Israeli soldiers stationed behind the border fence between the Gaza Strip and Israel opened fire at a watchtower belonging to Palestinian armed groups in the lands adjacent to the border fence, but no casualties were reported. At approximately 18:00, Israeli soldiers stationed behind the border fence between the Gaza Strip and Israel, opened fire at a security watchtower belonging to Palestinian armed groups in the lands adjacent to the border fence, east of Gaza Valley (Juhor al-Deek), but no casualties were reported. Note: During the aforementioned day, Israeli forces conducted (9) incursions in the following areas and no arrests were reported: Kufor Ra’ia village, southwest of Jenin, Nazlet Abu al-Nar, al-Nazlah al-Gharbiyah, and al-Nazlah al-Wusta villages, north of Tulkarm; Dura, Yatta, al-Shuyoukh, Surif and Sa’ir villages in Hebron. At approximately 01:00, Israeli forces moved into Nablus. They raided and searched a number of houses and the arrested Ibrahim ‘Emad al-Qutob (33) from the Old city, and Anas Shawkat al-Khalil (28) from Street (15) in the city. At approximately 05:00, the Israeli forces withdrew from the village. At approximately 02:00, Israeli forces moved into Selat al-Thaher village, south of Jenin. They raided and searched a number of houses and then arrested Hammam ‘Adel ‘Alaqmah (19) from Jenin refugee camp while he was visiting his relatives in the abovementioned village. At approximately 04:30, the Israeli forces withdrew from the village. At approximately 03:00, Israeli forces moved into al-Sheikh neighbourhood in Hebron. They raided and searched a house belonging to al-Rajbi family and then arrested Mohammed (22) and Ya’qoub Mahmoud al-Rajbi (24). At approximately 10:40, Israeli soldiers stationed behind the border fence between the Gaza Strip and Israel, opened fire at a watchtower belonging to Palestinian armed groups in the lands adjacent to the border fence, east of al-Maghazi, but no casualties were reported. At approximately 19:10 and until 19:40, Israeli warplanes fired 5 missiles at agricultural lands, which are around 800 meters into the west of the border fence between the Gaza Strip and Israel, east of al-Amal neighbourhood, northeast of Beit Hanoun. However, no casualties were reported. Note: During the aforementioned day, Israeli forces conducted (9) incursions in the following areas and no arrests were reported: Tulkarm, Shuweikah Suburb and Bal’a village, northeast of the city; Noor Shams refugee camp and Ramin villages, east of the city, ‘Azzoun village, east of Qalqiliyah; Dura, Ethna and Sa’ir villages in Hebron. At approximately 02:00, Israeli forces moved into Zeta Jama’in village, south of Nablus. They raided and searched a house belonging to Yazid Osama Yusuf Nasser (20) and then arrested him. At approximately 04:00, the Israeli forces withdrew from the village. Around the same time, Israeli forces moved into ‘Azzoun village, east of Qalqiliyah. They raided and searched a number of houses and then arrested Ahmed Adam Badwan (20) and Saif Hesham ‘Edwan (25). Around the same time, Israeli forces moved into Deir al-Hatab village, northeast of Nablus. They raided and searched a house belonging to Abdullah Abdul Hafith Dahoud ‘Oudah (36) and then arrested him. At approximately 03:00, Israeli forces moved into al-‘Asakrah village, east of Bethlehem. They raided and searched a number of houses and then arrested Yazan Khalid al-‘Asakrah (19) and Ahmed Khalaf ‘Asakrah (17). At approximately 04:00, Israeli forces moved into al-Am’ari refugee camp, south of Ramallah. They raided and searched a number of houses and then arrested 4civilians namely Baha’a Jamal Jaber (25), Jihad Abdullah Abu al-‘Arif (24), Mohammed Jamal al-Ashqar (20) and Jamal Mahmoud Jaber (55). Around the same time, Israeli forces moved into Beit Rema village, northwest of Ramallah. They raided and searched a house belonging to Mahmoud ‘Emad al-Remawi (20) and then arrested him. Around the same time, Israeli forces moved into Silwad village, northeast of Ramallah. They raided and searched a house belonging to Nash’at Anwar Hamed (26) and then arrested him. At approximately 05:00, Israeli forces moved into Dura al-Qare’a village, north of Ramallah. They raided and searched a house belonging to Basel Osama Qasem (19) and then arrested him. At approximately 07:30, Israeli forces accompanied with 5 military vehicles moved about 100 meters into the east of al-Buraij refugee camp in the central Gaza Strip. they leveled lands adjacent to the border fence between the Gaza Strip and Israel. The incursion continued for 3 hours and then the Israeli forces redeployed behind the border fence. Around the same time, Israeli soldiers stationed behind the border fence between the Gaza Strip and Israel opened fire at a military watchtower belonging to Palestinian armed groups in the lands adjacent to the border fence, east of al-Maghazi. However, no casualties were reported. Note: During the aforementioned day, Israeli forces conducted (3) incursions in the following areas and no arrests were reported: Dura and Kharsa villages in Hebron, Baqah Eastern village, north of Tulkarm. At approximately 01:00, Israeli forces moved into Nablus. They raided and searched several houses and then arrested Mohammed Ja’far Khuweirah (22), ‘Ala’a Ahmed Hmedan (24) and Mohammed Kayed al-Nuri (20). At approximately 05:00, the Israeli forces withdrew from the city. Around the same time, Israeli forces moved into ‘Asker Old refugee camp, northeast of Hebron. They raided and searched a number of houses and then arrested Ahmed Ibrahim Abu Salem (20). At approximately 01:30, Israeli forces moved into Maithaloun village, southeast of Jenin. They raided and searched a house belonging to Kefah No’man Abdullah Na’erat (27) and then arrested him. At approximately 04:30, the Israeli forces withdrew from the village. Around the same time, Israeli forces accompanied with a number of military vehicles moved into Abu Ridah neighborhood, east of Khuza’ah village, east of Khan Yunis. They leveled the lands and put a barbed wire about 50 meters away from the main border fence near the demonstration camp established by the Supreme National Authority for the Great March of Return and Breaking Siege, east of the abovementioned neighborhood. The Israeli forces also surrounded it with sand barriers and put some camps about 400 meters away from the border fence. Around the same time, another Israeli forces moved into ‘Abasan al-Jadidah village, east of Khan Yunis adjacent to the demonstration encampment, established by the Supreme National Authority for the Great March of Return and Breaking Siege, 350 meters away from the border fence. They put a barbed wire fence about 50 meters away from the border fence amidst opening fire. As a result, 3 civilians, including a woman, were wounded. After 4 hours, they redeployed behind the border fence, which witnessed an intensive spreading of the Israeli forces and their vehicles, tanks and bulldozers in addition to water pumps and snipers, who deployed at and behind hills and sand barriers, particularly adjacent to the 3 encampments of the March of Returm, east of Khan Yunis. At approximately 01:30, Israeli forces moved into Maithaloun village, southeast of Jenin. They raided and searched a house belonging to Kefah No’aman Abdullah Na’irat (27) and then arrested him. At approximately 04:30, the Israeli forces withdrew from the village. At approximately 02:00, Israeli forces moved into Hebron. They raided and searched 2 houses belonging to Noor Abdul Fattah al-Qawasmeh (24) and Mohammed Mahmoud Fnounah (55). Around the same time, Israeli forces moved into Tulkarm and stationed on al-Saf street in the center of the city. They raided and searched a house belonging to Younis ‘Ali Abu Hanak (23) and then arrested him. At approximately 02:45, Israeli focus accompanied with 2 tanks and 2 bulldozers moved about 50 meters into the east of Abu Safiyah Hill, northeast of Jabalia in the northern Gaza Strip. they leveled lands that were leveled before amidst sporadically opening fire. As a result, civilians who were in the demonstration camps, 80 meters away from the incursion area. The shelling caused severe material damage, no casualties were reported. At approximately 05:15, Israeli forces flew a black drone carrying a bottle filled with Benzen with an explosive device fixed to bottle. They threw the bottle at the March of Return encampments that were established about 800 meters into the west of the border fence, east of Abu Safiyah hill, northeast of Jabalia in the northern Gaza Strip. As a result, some of the cars’ tires that were used during the clashes were burnt. The civilians were able to extinguish the fire and no casualties were reported. At approximately 13:10, Israeli forces fired 2 artillery shells at a military watchtower belonging to al-Qassam brigade (the Military Armed Wing of Hamas Movement), east of al-Shuhada’a Islamic Cemetery in the northern Gaza Strip. The watchtower is about 300 meters away from the border fence between the Gaza Strip and Israel. The shelling caused severe material damage to the watchtower, but o casualties were reported. At approximately 15:25, Israeli warplanes launched 2 missiles at Palestine site belonging to al-Qassam Brigades (Military Armed Wing of Hamas Movement). The site is established into the northeast of Um El-Naser (Bedouin) village in the northern Gaza Strip. At approximately 15:35, Israeli warplanes launched 4 missiles at the same site. As a result, the site sustained severe material damage, but no casualties were reported. The huge explosion that rocked the area in the northern Gaza Strip caused fear to civilians whose houses are near the site, particularly women and children. At approximately 16:40, Israeli forces stationed behind the border fence between the Gaza Strip and Israel fired 3 artillery shells at a watchtower belonging to Palestinian armed groups in the lands adjacent to the border fence, east of al-Buraij. The shelling caused material damage to the site, but no casualties were reported. At approximately 17:30, Israeli warplanes launched 2 missiles at Bader military site and Bahriyah site near al-Baidar Resort, south of Gaza City. However, no casualties were reported. Around the same time, Israeli warplanes launched a site belonging to Palestinian armed groups, southwest of Gaza City. The airstrike caused severe damage to the site, but no casualties were reported. At approximately 19:15, Israeli forces stationed behind the border fence between the Gaza Strip and Israel fired 3 missiles at a watchtower belonging to Palestinian armed groups in the lands adjacent to the border fence, east of al-Maghazi. The shelling caused severe damage to the site, but no casualties were reported. Note: During the aforementioned day, Israeli forces conducted (3) incursions in the following areas and no arrests were reported: Jaba’a village, south of Jenin; Beit Awla and Bani Na’im villages in Hebron. At approximately 01:00, Israeli forces moved into ‘Asirah northern village, north of Nablus. They then raided and searched a number of houses and then arrested 3 civilians namely Abi Hasan Hamadnah (33), ‘Ala’a Awad al-Shouli (31) and Ahmed Abdul Hadi Hmadnah (38). Around the same time, Israeli forces moved into Salem village, northeast of Nablus. They raided and searched a house belonging to Mohammed Nasouh Eshtiyah (22) and then arrested him. At approximately 04:30, Israeli forces withdrew from the village. Around the same time, Israeli infantry units raided and searched a house belonging to Fawzi Abdul Mo’ti al-Fakhuri in Gheith neighborhood, east of the Ibrahimi Mosque in Hebron’s Old City, and then arrested him. At approximately 01:15, Israeli forces moved into al-Yamoun village, west of Jenin. They raided and searched a number of houses and then arrested Ahmed ‘Ali Khamaisah (43). At approximately 01:30, Israeli forces moved into ‘Aydah refugee camp, north of Bethlehem. They raided and searched a number of houses and then arrested Mo’atasem Khalil Abu Surour (26) and ‘Ali Abu Surour (24). At approximately 02:00, Israeli forces moved into Madama village, south of Nablus. They raided and searched a house belonging to Asadullah Wjih Kamel Qet and then arrested him. At approximately 04:00, the Israeli forces withdrew from the village. Around the same time, Israeli forces moved into Qaryout village, southeast of Nablus. They raided and searched a house belonging to Jihad Salah Eden al-Boum (41) and then arrested him. Around the same time, Israeli forces moved into Abu Katilah neighborhood in Hebron. They raided and searched a house belonging to Rami jihad ‘Ouda al-Khatib (34) and then arrested him. Around the same time, Israeli forces moved into Halhoul, north of Hebron and stationed in Zuyoud neighborhood. They raided and searched a house belonging to Yazid Yusuf abdul Karim Zama’rah (24) and then arrested him. At approximately 02:15, Israeli forces moved into al-Laban eastern village, south of Nablus. They raided and searched a house belonging to Ja’far Ahmed Faleh Dababsah (34) and then arrested him. Around the same time, Israeli forces moved into Talouzah village, north of Nablus. They raided and searched a house belonging to Ashraf Zaher Mohammed ‘Ouweis (24) and then arrested him. At approximately 02:30, Israeli forces moved into Tal village, southwest of Nablus. They raided and searched a house belonging to Mahmoud Saqer Hasan ‘Asidah (29) and then arrested him. At approximately 03:00, Israeli forces moved into Taqou’a village, east of Bethlehem. They raided and searched a house belonging to Saqer Samih Jebril (25) and then arrested him. At approximately 03:15, Israeli forces moved into Selah al-Harethiyah village, west of Jenin. They raided and searched several houses and then arrested Hatem abdul Qader Barghouth (20), a student at the Arab American University. At approximately 16:30, Israeli forces moved into Beit Fajjar village, south of Bethlehem. They raided and searched a number of houses and then arrested Rami Mohammed Thawbtah (20) and ‘Ala’a Mohammed Taqatqa (22). Note: During the aforementioned day, Israeli forces conducted (4) incursions in the following areas and no arrests were reported: Beit Ummer, al-Shuyoukh, al-Mawreq villages in Hebron; and Barqin village west of Salfit..
At approximately 01:30, Israeli forces moved into Beir al-Basha village, south of Jenin. They then raided and searched several houses and then arrested Rakan Dawoud Mahmoud Ghawadrah (27) and Shadi ‘Ali Mahmoud Ghawadrah (25). At approximately 02:00, Israeli forces moved into Shuyoukh al-‘Arab village, north of Hebron. They raided and searched 3 houses belonging to Mohammed Yusuf Jenjarah (16), Abdul Razeq Mohammed Abu Sal (16) and Iyad Ismail ‘Eid (19). Around the same time, Israeli forces moved into al-‘Arqah village, south of Jenin. They raided and searched houses and then arrested ‘Alaa Tawfiq Mostafa Yahiya (23). At approximately 02:15, Israeli forces moved into Madama village, south of Nablus. They raided and searched a number of and then arrested Mohammed ‘Essa Nassar (22), Rashid Ramez Nassar (16) and Ra’ad Mo’atasem Zeyadah (24). At approximately 02:30, Israeli forces moved into Jericho. They raided and searched a number of houses and then arrested ‘Ali Abdul Karim Abu Zenah (22) and Fadi Mohammed Jahalin (24). Around the same time, Israeli forces moved into Betin village, northeast of Ramallah. They raided and searched a house belonging to Mohammed Hashem Hammad (20) and then arrested him. Around the same time, Israeli forces moved into al-Jalazoun refugee camp, north of Ramallah. They raided and searched a house belonging to Mo’men Yahiyah Zaid (21) and then arrested him. At approximately 03:45, Israeli forces moved into al-Moghir village, northeast of Ramallah. They raided and searched a number of house and then arrested Yahiyah Bader Abu ‘Alia’a (24) and ‘Essam Ahmed Abu ‘Alia’a (21). Around the same time, Israeli forces moved into Burin village, south of Nablus. They raided and searched a number of houses and then arrested Walid Mursi ‘Eid (27). At approximately 05:00, Israeli forces moved into Qarawet Bani Zaid village, northwest of Ramallah. They raided and searched a hose belonging to Sa’oud Nasser ‘Arar (25) and then arrested him. Around the same time, Israeli forces moved into Kufor Ne’ma village, west of Ramallah. They raided and searched a house belonging to Oseid ‘Abedeen Abu ‘Oudai (26) and then arrested him. At approximately 07:00, Israeli forces accompanied with a number of military vehicles and bulldozers moved about 100 meters from the border fence between the Gaza Strip and Israel into al-Shawkah village, east of Rafah in the southern Gaza Strip. They leveled and combed the area and redeployed along the border fence at approximately 09:00 on the same day. At approximately 15:50, Israeli forces opened fire at the border area, east of al-Shuhada’a Islamic Cemetery in the northern Gaza strip. Following this, they fired an artillery shell at a watchtower belonging to al-Qassam Brigades (the Military Armed wing of Hamas Movement), which is around 300 meters into the south of the border fence between the Gaza Strip and Israel. The shelling caused severe material damage to the site, but no casualties were reported. At approximately 16:00, Israeli forces stationed behind the border fence between the Gaza Strip and Israel, east of al-Na’aimah street, east of al-Amal neighborhood, northeast of Beit Hanoun in the northern Gaza Strip, opened fire at Palestinian agricultural lands adjacent to the border fence. As a result, the farmers whose lands adjacent to the area were forced to flee fearing for their lives, but no casualties were reported. At approximately 19:20, Israeli forces stationed behind the border fence between the Gaza Strip and Israel fired artillery shells at 2 military watchtowers belonging to Palestinian armed groups in the lands adjacent to the border fence, east of al-Buraij and al-Maghazi. The shelling caused material damage to the sites, but no casualties were reported. Note: During the aforementioned day, Israeli forces conducted (3) incursions in the following areas and no arrests were reported: Hebron; Deir Samet and Howarah villages, south of Nablus. At approximately 17:15 on Thursday, 10 May 2018, dozens of Palestinian civilians assembled in eastern al-Shokah village, east of Rafah City in the southern Gaza Strip within the demonstrations of the Return and Breaking the Siege March. The demonstrators burned tires while a number of them approached the border fence between the Gaza Strip and Israel so the Israeli soldiers opened fire at them. As a result, a 27-year-old civilian was hit with a bullet to the right leg and then transferred to Abu Yousif al-Najjar Hospital in Rafah City, where doctors described his injury as moderate. Photojournalist Mo’atasem Ahmed Ibrahim Daloul (40) was hit with a bullet to the back. Diaa’ Fayez Shokri Abu ‘Oan (27) sustained shrapnel wounds to the shoulder, hand and knee. On Friday morning, hundreds of civilians started swarming into the demonstration yard in the Return encampment established by the Supreme National Authority for the Return and Breaking the Siege March in eastern Khuza’ah village in eastern Khan Younis surrounded by the border fence from the northern and eastern side ranging between 250-500 meters and performed the Friday prayer there. At approximately 13:30, the number of participants gradually increased, reaching a peak at approximately 16:00, in the five demonstration areas, and they were estimated at thousands. They deployed inside and outside the encampment yards, raising flags, and chanting slogans and national songs in addition to flying kites, while hundreds of them, including children and women, approached the border fence, set fire to tires and attempted to throw stones at the Israeli forces. Observations by PCHR’s fieldworkers showed that Dozens of Israeli Forces’ snipers continued to position on the hills, behind the sand barriers and in military jeeps along the border fence opposite to the Return encampments and selectively and deliberately opened fire at the demonstrators in addition to firing randomly and heavily tear gas canisters at the whole area. The number of youth gatherings near the border fence augmented to reach dozens who set fire to tires and attempted to throw stones at the Israeli forces in eastern Khuza’ah. The Israeli forces widely fired bursts of tear gas canisters, targeting the center of the demonstrations and near the demonstrators along the border fence. As a result, dozens suffered tear gas inhalation; including PCHR’s fieldworker and volunteer fieldworkers who were documenting the events. Moreover, the direct targeting with tear gas canisters significantly increased as 86 injuries were reported. Moreover, these gases caused breath difficulties and seizures among civilians, and many of them were transferred to hospitals. According to the field observations as well, the demonstrations were as always fully peaceful, and PCHR’s fieldworkers did not witness any armed manifestations or armed persons even dressed in civilian clothes among the demonstrators, who were thousands of elderlies, women, children and entire families, demonstrating near the border fence and raising flags, chanting slogans and national songs, flying kites and burning tires. The Israeli fire continued until 20:00 according to PCHR’s fieldworkers in the 5 areas. As a result, Jaber Salem ‘Abdullah Abu Mustafa (39), from Khan Younis, was killed after being hit with a bullet to the chest at approximately 16:28 when he was around 100 meters away from the border fence, north of the Return encampment. His death was declared upon arrival at the Gaza European Hospital. Moreover, 117 civilians were wounded, including 11 children, 3 women, 4 journalists, and a paramedic. Thirty-one civilians were hit with live bullets and their shrapnel and 86 civilians were directly hit with tear gas canisters. All those wounded were taken to field hospitals and clinics in the refugee camp and then referred to Naser, Gaza European and Algerian hospitals. Four of those wounded suffer serious wounds. At approximately 13:30, demonstrators started swarming to the encampments established by the Supreme National Authority for the Great March of Return and Breaking Siege, 350 meters away from the border fence between the Gaza Strip and Israel, east of al-Buraij in the central Gaza Strip. A number of children and young men approached the border fence, set fire to tires and threw stones at Israeli soldiers stationed behind sand barriers along the border fence. The soldiers sporadically fired live bullets and tear gas canisters at the protestors and the Return March encampments. The clashes continued until the evening. As a result, 31 civilians, including 6 children were wounded. Twenty-nine of them were hit with live bullets and 2 civilians were directly hit with tear gas canisters to their bodies. The wounded civilians were transferred to al-Aqsa hospital in Deir al-Balah via PRCS ambulances and doctors described the injuries of 2 of them as serious while injuries of the others ranged between minor and moderate. The Israeli soldiers also targeted with tear gas canisters the place where the ambulances were parked on Jakar Street which is 300 meters away from the border fence. As a result, a number of paramedics and participants suffered tear gas inhalation. Around the same time, Israeli forces stationed along the border fence between the Gaza Strip and Israel, east of Abu Safiyah Hill, northeast of Jabalia in the northern Gaza Strip fired live and rubber bullets and tear gas canisters at hundreds of civilians who were there participating in the seventh Friday of the Return and Breaking Siege March demonstrations upon a call by the Supreme National Authority under the title of “Preparation Friday” The demonstrators burned tires and threw stones at the Israeli soldiers stationed behind the sand barriers. The clashes which continued until 20:00 resulted in the injury of 60 civilians, including 10 children and 3 women. Forty-six of them were hit with live bullets and the other 14 were directly hit with tear gas canisters. Those wounded were taken by ambulances of the PRCS, military medical services, Union of Health Work Committees and Ministry of Health to the Indonesian Hospital, al-Awda Hospital and Kamal ‘Adwan Hospital. Doctors there classified the injuries of 6 of them as serious. At approximately 15:00, thousands of civilians, including women, children and elderlies with entire families swarmed to the Return camp established by Supreme National Authority for the Great March of Return and Breaking Siege, east of al-Shawkah village, east of Rafah in the southern Gaza Strip, around 300 meters away from the border fence between the Gaza Strip and Israeli. The demonstrators raised flags, chanted national slogans as some of them approached the border fence. They also set fire to tires, flew kites and threw stones at the Israeli soldiers. The soldiers then fired live bullets and tear gas canisters. The clashes, which continued until 20:00, resulted in the injury of 49 civilians, including 8 children and a journalist. Forty-two of them were hit with live bullets and their shrapnel, 1 with a rubber bullet and 6 were directly hit with tear gas canisters, including a journalist Hisham Mohammed Fakhri al-Nawajhah (21). Moreover, the soldiers targeted with 2 tear gas canisters an ambulance of the Military Medical Services with a bullet and another belonging to the Civil Defense. The etar gas canister penetrated the window and 4 paramedics suffered gas inhalation. The wounded were taken to the field clinic in the camp and then referred to Abu Yusuf al-Najjar Hospital in Rafah and Gaza European Hospital in Khan Yunis. Doctors classified 7 civilians’ injuries as serious. At approximately 11:30 on Saturday, 12 May 2018, the Israeli forces stationed along the border fence behind a sand barrier which is around 50 meters away from the border fence between the Gaza Strip and Israel, east of Abu Safiyah Hill, northeast of Jabalia in the northern Gaza Strip opened fire at dozens of civilians who were around 100-200 meters away from the western side of the border fence setting fire to tires and throwing stones at the Israeli soldiers. As a result, 2 civilians were wounded and their condition is moderate. At approximately 13:30 Saturday, 12 May 2018, dozens of protestors started swarming to the Return camps established in eastern al-Buraij in the central Gaza Strip, to participate in the March of Return activities. Dozens of young men and children gathered near the border fence between the Gaza Strip and Israel as number of them approached the barbed wire fence. They threw stones at Israeli soldiers stationed behind sand barriers along the border fence. The soldiers fired live bullets and tear gas canisters at them. The clashes continued until the evening. As a result, an 11-year-old child from al-Buraij was hit with a tear gas canister to the hand and doctors classified his injury as minor. At approximately 16:30, on Sunday, 13 May 2018, Israeli forces stationed behind a sand barrier, 50 meters away from the eastern side of the border fence between the Gaza Strip and Israel, east of Abu Safiya Hill, northeast of Jabalia in the northern Gaza Strip, opened fire at dozens of civilians who were around 100-200 meters away from the western side of the border fence setting fire to tires and throwing stones at the Israeli soldiers. As a result, 3 civilians were wounded and their condition is moderate. At approximately 18:00 on the same Sunday, dozens of Palestinian civilians gathered in eastern side of Malakah intersection, east of al-Zaytoun neighborhood, east of Gaza City, to participate in the “The Great March of Return” activities. They threw stones at Israeli soldiers stationed behind the border fence between the Gaza Strip and Israel. He soldiers fired live bullets and tear gas canisters at them. As a result, 4 civilians were wounded, including Suleiman Mohammed al-Sersek (7) who was hit with a live bullet to the right shoulder. 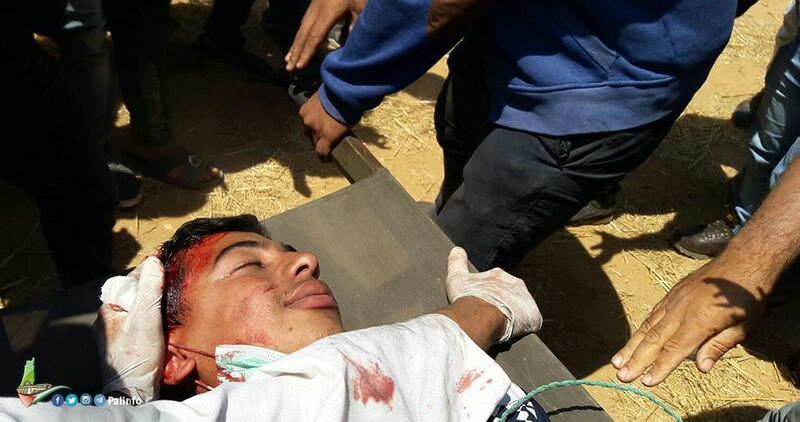 Sa’di Sa’ied Fahmi Abu Salah (16), from Beit Hanoun, was hit with a live bullet to the abdomen. Talal ‘Adel Ibrahim Matter (16) was hit with a live bullet to the head. Khan Younis: (16) civilians were killed, including a child and a person whose legs were amputated in a previous bombing. Moreover, 287 civilians, including 31 children, 11 women and 3 journalists were wounded. Two hundred and forty five of them were hit with live bullets and 42 were directly hit with tear gas canisters. Thirty of them were seriously injured. Among the injured was Mahmoud Ahmed Abdul Ra’ouf Abdul Ghafour (32) a volunteer researcher at PCHR from Khan Yunis was hit at approximately 12:45 with a live bullet that penetrated the upper side of right shoulder to the left side of the back. He was transferred to Nasser Hospital as his injury was serious and then his medical condition was settled. Mahmoud was wounded while he was at around 150 meters away from the border fence to take photos and document the injury of a group of wounded civilians near the demonstration yard in ‘Abassan al-Kabrah in which he has been since 10:00. Mahmoud Suleiman Ibrahim ‘Aqel (33) from ‘Abasan al-Kabirah was hit with 2 bullets to the right knee and left thigh. ‘Ali Mohammed Ahmed Khafajah (21) was hit with a bullet to the head. Nasser Ahmed Mahmoud Ghurab (52) from al-Nuseirat was hit with a live bullet to the chest while he was in front of the camps, 600 meters away from the border fence. Bilal Bdair Husein al-Ashram (17) from Deir al-Balah was hit with 2 live bullets to the chest and right leg. Around the same time, hundreds of civilians, including women and children and entire families swarmed to the March of Return camps, east of Khuza’a village, east of Khan Yunis. A number of civilians made their way to the north and northeast of the camp. They set fire to tires, chanted slogans, raised flags and some of them attempted to approach the border fence. Israeli forces stationed behind hills and sand barriers and in military vehicles along the border fence, sporadically opened fire and fired tear gas canisters for 4 hours. As a result, 7 civilians, including a female paramedic and 3 journalists, were wounded. The volunteer paramedic, who works at al-Tawba Charity Society, was hit with a tear gas canister to the head fired by a drone. Moreover, journalists were directly hit with tear gas canisters to the head and limbs. At approximately 03:30 on the same Tuesday, Israeli forces stationed behind a sand barrier, 50 meters into the east of the border fence between the Gaza Strip and Israel, east of Abu Safiyah Hill, northeast of Jabalia in the northern Gaza Strip, opened fire at dozens of civilians who were at distances ranging between 100 to 200 meters into the west of the abovementioned border fence. The protestors set fire to tires and threw stones at Israeli soldiers. As a result, 7 civilians, including a child, were hit with live bullets. At approximately 16:00 on Tuesday, hundreds of Palestinian civilians gathered in the March of Return camps, east of al-Shawkah village, east of Rafah in the southern Gaza Strip to participate in “The Great March of Return and Breaking Siege” activities. The protestors threw stones at the Israeli soldiers stationed behind the border fence between the Gaza Strip and Israel. The soldiers sporadically fired live bullets and tear gas canisters from a drone. As a result, 11 civilians, including 2 children, were wounded. Nine civilians were hit with live bullets and its shrapnel and 2 were directly hit with tear gas canisters. An ambulance also sustained damage. At approximately 16:30 on the same Tuesday, dozens of Palestinian civilians gathered into the east of Malakah intersection, east of al-Zaytoun neighborhood, east of Gaza City to participate in “The Great March of Return and Breaking Siege” activities. The protestors threw stones at Israeli soldiers stationed behind the border fence between the Gaza Strip and Israel. The soldiers fired live bullets and tear gas canisters at them. As a result, 3 civilians were wounded in addition to an ambulance belonging to the Ministry of Health. At approximately 15:30 on Wednesday, 16 May 2018, a number of Palestinian young men and children gathered near the border fence between the Gaza Strip and Israel, east of al-Buraij in the central Gaza Strip to participate in the March of Return activities. A number of them threw stones at Israeli soldiers stationed behind the border fence. The Israeli soldiers fired live bullets and tear gas canisters at them. As a result, a 49-year-old civilian from al-Buraij was hit to the lower limbs while he was in the Return encampment area. At approximately 17:00, Israeli forces stationed behind the border fence with Israel, east and northeast of the Return encampment, east of Khuza’ah village, east of Khan Yunis in the southern Gaza Strip, sporadically fired live bullet and tear gas canisters for 2 hours at a group of civilians who were in the vicinity of the camp. Some of the civilians attempted to approach the border fence. As a result, 2 civilians, including a child, were wounded. They were transferred to Gaza European Hospital and doctors classified their injuries as moderate. The Israeli forces also fired several tear gas canisters at the center of the camp in coincidence with the participation of hundreds of civilians, including women and children, in memorial service of those killed by Israeli forces in the March of Return activities last Friday. As a result, most of them suffered tear gas inhalation. At approximately 18:00 on the same Wednesday, dozens of Palestinian civilians gathered into the east of Malakah intersection, east of al-Zaytoun neighborhood, east of Gaza City, to participate in “The Great March of Return and Breaking Siege” activities. The protestors threw stones at Israeli soldiers sporadically fired live bullets and tear gas canisters at them. As a result, a civilian was hit with a live bullet to the right shoulder. Following the Friday prayer on 11 May 2018, dozens of Palestinian children young men gathered at the northern entrance to al-Birah. They threw stones and empty bottles at the Israeli soldiers stationed at “al-Mahkamah” checkpoint established near “Beit Eil”settlement, north of the city. The Israeli soldiers fired live and rubber bullets, sound bombs and tear gas canisters at the protestors. As a result, a 20-year-old civilian form al-Birah was hit with a live bullet to the foot. At approximately 18:30 on the same Friday, a number of youngsters and young men gathered at the main entrance to ‘Aqabet Jaber refugee camp, south of Jericho. They threw stones and empty bottles at Israeli soldiers stationed near the abovementioned entrance. The soldiers immediately fired live bullets, rubber-coated metal bullets, sound bombs and tear gas canisters at them. As a result, a 21-yearold civilian was hit with a live bullet to the abdomen. He was transferred to Jericho Governmental Hospital and doctors classified his injury as moderate. On Monday morning, 14 May 2018, Palestinian civilians organized a peaceful demonstration from Bab Zeqaq area in the center of Bethlehem and then headed to military checkpoint (300), north of the city. Israeli soldiers fired rubber-coated metal bullet and tear gas canisters at the protestors, who chanted slogans demanding the right to return. As a result, 7 civilians were hit with rubber bullets. At approximately 11:30, dozens of Palestinian children and young men gathered at the main entrance to al-Nabi Saleh village, northwest of Ramallah. They threw stones and empty bottles at Israeli soldiers stationed near a military watchtower stationed there. The Israeli soldiers fired live and rubber bullets, sound bombs and tear gas canisters at them. As a result, a 17-year-old civilian from Deir Netham village was hit with a live bullet to the right foot. At approximately 12:00, Palestinians organized a protest from Yasser Arafat Square in the center of Ramallah and then headed to Qalandiya military checkpoint at the northern entrance to Jerusalem. The protestors set fire to tires and threw stones and empty bottles at Israeli soldiers stationed at the abovementioned checkpoint. The soldiers fired live bullets, rubber-coated metal bullets, sound bombs and tear gas canisters. They also chased the protestors to the outskirts of Qalandiya refugee camp. As a result, 9 civilians were hit with rubber bullets. At approximately 14:00, dozens of youngsters and young men protested at the main entrance to ‘Aqaba refugee camp, south of Jericho, where an Israeli military watchtower is established. The protestors threw stones and empty bottles at Israeli soldiers. The soldiers fired live bullets and tear gas canisters at them. As a result, 2 civilians were hit with rubber bullets. At approximately 14:30 on the same Monday, a group of Palestinian civilians moved from Kufor Qaddoum village, northeast of Qalqiliyah, to the eastern entrance to the village, which has been closed for 15 years in favor of the entrance to “Kedumim” settlement established on the village lands. The protestors chanted national slogans demanding end of occupation, condemning the U.S President Donald Trump’s decision to recognize Jerusalem as the capital Israel and condemning the Israeli forces’ crimes against Palestinian protestors along the eastern border of the Gaza Strip within “The Great March of Return and Breaking the Siege” activities. The protestors set fire to tires, threw stones at Israeli soldiers stationed behind sand barriers. The soldiers fired live and rubber bullets, sound bombs and tear gas canisters at them. As a result, a 14-year-old civilian was hit with a rubber bullet to the left lag. Note: peaceful demonstrations were organized on Monday, 14 May 2018 in the vicinity of “Jishuri” Factories, west of Tulkarm; at the annexation wall gate No. (254) established on Zeta village lands, north of the city; the southern checkpoint to Qalqiliya; and “Eyal”crossing at the northern entrance of the city; the entrance to Beit ‘Azzoun village, east of the city; Howarah checkpoint at the southern entrance to Nablus; Beta and al-Laban Eastern village, south of the city; Taqou’a village, east of Bethlehem. The clashes between the protestors and the Israeli forces in the abovementioned places resulted in dozens of protestors suffering tear gas inhalation, but no other injuries were reported. At approximately 12:00 on Tuesday, 15 May 2018, a number of civilians gathered at the entrance to al-Laban Eastern village, branching from Ramallah-Nablus Street. 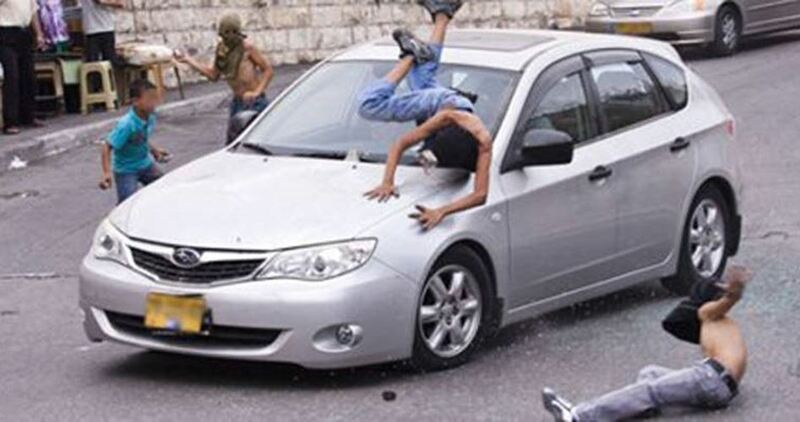 They threw stones and empty bottles at Israeli vehicles that were at the abovementioned entrance. The Israeli forces fired live bullets, sound bombs and tear gas canisters at them to disperse them and then chased them. They arrested Mohammed Abdul Nasser Taiseer Nubani (18) and Kamal ‘Edwan Khader ‘Ouwais (18). A 23-year-old civilian was also hit with a live bullet to the foot. He was transferred to Yasser Arafat Hospital in Salfit to receive medical treatment. Around the same time, national factions and organizations in Bethlehem organized a mass demonstration on the 70th anniversary of the Palestinian Nakbah and condemning Israeli crimes in the Gaza Strip and against inauguration of the U.S embassy in occupied Jerusalem. They moved from Bab Zeqaq intersection in the city and passed by Jerusalem-Hebron Street and arrived at the vicinity of Bilal Bin Rabah Mosque (Rachel’s Tomb), where the clashes erupted with the Israeli forces. The participants raised Palestinian flags and black flags and banners confirming the right to return. The Israeli soldiers fired rubber-coated metal bullets and tear gas canisters at the protestors and chased them. The soldiers then arrested Yasameen Ayman Kan’an (16). As a result, 8 civilians, including 2 women, were wounded, in addition to journalist Mousa al-Sha’er who was hit with a rubber bullet. A number of journalists said to PCHR’s fieldworkers that the Israeli soldiers intended to attack them while they were gathering near the clashes area, as an officer in the Civil Administration known as ” ‘Anan” checked the journalists’ ID cards while they were on duty claiming he wanted to make sure of their identities. At approximately 13:30 on Tuesday, a group of Palestinian civilians organized a protest from al-Shuhada’a intersection in the center of Nablus and then headed to Howarah checkpoint at the southern entrance to the city, condemning the Israeli forces crimes in the Return encampments in the Gaza Strip, and relocation of the U.S embassy to occupied Jerusalem. The participants raised the Palestinian flags and chanted slogans against Israel and America. They then set fire to tires on the main street and threw stones at Israeli soldiers stationed behind cement cubes. The Israeli forces immediately fired live and rubber bullets and tear gas canisters at them. As a result, 7 civilians, including 2 children and a photo journalist of An-Najah NBC. Moreover, a protestor’s hand was burnt because he fell on a tire on fire while the Israeli forces were chasing him and a child’s hand was broken after he fell on the ground because the Israeli forces were chasing him. The wounded journalist was identified as ‘Omeir Jamal Lutfi Estiyah (24) from Nablus who was hit with a rubber bullet to the left leg. Around the same time, dozens of Palestinian civilians protested at the northern entrance to al-Birah to commemorate the Palestinian Nakbah, condemn moving the U.S embassy to occupied Jerusalem and condemn the Israeli forces crimes in the Gaza Strip. The protestors set fire to tires and threw stones and empty bottles at Israeli forces. The soldiers stationed at “al-Mahkamah” checkpoint established near “Beit Eil” settlement fired live and rubber bullets, sound bombs and tear gas canisters at them. as a result, 16 civilians were wounded. Fifteen of them were hit rubber bullets and one of them was hit in his eye, while a 19-year-year-old civilian was hit with a live bullet to the abdomen. Doctors classified his injury as serious. Note: PCHR apologizes for publishing the table of Movement at Beit Hanoun “Erez” Crossing for the reporting period as the competent authorities at the crossing has not so far prepared it. Hebron: Israeli forces established (21) checkpoints all over the city. On Thursday, 10 May 2018, Israeli forces established 3 checkpoints at the entrances to Beit Ummer and al-Dahiryia villages and at the western entrance to Hebron. On Friday, 11 May 2018, Israeli forces established 2 checkpoints at the entrance to Beit Ola village and at the entrance to al-Fawar Refugee Camp. On Saturday, 12 May 2018, 4 similar checkpoints were established at the entrances to al-Shayyoukh and Sa’ir villages, at the northern entrance to Hebron, and at the southern entrance to Hebron. On Sunday, 13 May 2018, Israeli forces established 3 checkpoints at the entrances to Beit ‘Awaa and Jalajel villages and at the southern entrance to Halhoul village. On Monday, 14 May 2018, 2 similar checkpoints were established at the entrances to al-Dahiriyia and Samou’a villages. On Tuesday, 15 May 2018, Israeli forces established 3 checkpoints at the entrances to Dura, Halhoul and al-Dahiriyia villages. On Wednesday, 16 May 2018, Israeli forces established 4 checkpoints at the entrances to Beit Ummer, al-Shayyoukh, al-Majd, and Abu al-‘Asjah villages. Qalqiliyia: Israeli forces established (8) checkpoints all over the city. On Saturday, 12 May 2018, Israeli forces established 3 checkpoints at the entrances to ‘Azoun and ‘Izbit al-Tabeeb villages, east of Qalqiliyia; and between Kafur Thulth and ‘Azoun villages, northeast of the city. At approximately 15:00 on Sunday, 13 May 2018, Israeli forces established a checkpoint at the entrance to ‘Izbit al-Tabeeb village, east of Qalqiliyia. At approximately 17:00, a similar checkpoint was established at the eastern entrance to the city. On Monday, 14 May 2018, Israeli forces established 3 checkpoints at the eastern entrance to Qalqiliyi; at the entrance to Heblah village, south of the city; and at the entrance to ‘Azoun village, east of the city. At approximately 13:30 on Sunday, 13 May 2018, Israeli forces established a checkpoint under ‘Askaka village’s bridge. At approximately 18:30, the Israeli forces re-established the abovementioned checkpoint in the same area. At approximately 00:15 on Monday, 14 May 2018, Israeli forces established a checkpoint between Dir Balout and Rafat villages, west of the city. At approximately 23:30 on Monday, 14 May 2018, Israeli forces established a checkpoint between Burqeen and Qarawet Bani Zaid villages, west of Salfit. At approximately 18:30 on Friday, 11 May 2018, and following the declaration of a run over attack at the military checkpoint established at the entrance to al-Nafoura village, branching from Nablus-Jenin Street, adjacent to “Shomron“ settlement and fleeing the car driver fearing of opening fire at him and then surrendering himself to the Palestinian Security Services in Nablus as a normal traffic accident, Israeli forces established 3 checkpoints at Dir Sharaf village’s square, northwest of Nablus; above Madama village’s bridge on “Yitzhar “settlement bypass road, south of the city; and at checkpoint (17) that connects between Nablus and northern ‘Asirah village, north of the city. At approximately 19:30 on Friday, 11 May 2018, Israeli forces established a checkpoint at the intersection of ‘Araba village, branching from Nablus-Jenin Street, south of Jenin. At approximately 10:00 on Thursday, 10 May 2018, Israeli forces stationed at Abu al-Reesh checkpoint, east of al-Ibrahimi Mosque in Hebron’s Old City, arrested Yazeed Naser al-Haimouny (10) and then took him to the old bus station, which is under the Israeli forces’ control. Moreover, the Israeli forces chased students and denied them access to the gate. Raied Abu Remilah said that the Israeli forces were chasing the students and preventing them from approaching. An Israeli soldier also pointed his rifle at the students to deny their access to the gate. At approximately 13:30 on Friday, 11 May 2018, Israeli forces stationed at al-Container checkpoint, northeast of Bethlehem, arrested ‘Odai Fathi ‘Ayyad (24) from al-Dahisha Refugee Camp, north of Bethlehem, while crossing the checkpoint. At approximately 23:30 on Saturday, 12 May 2018, Israeli forces established a checkpoint at the entrance to ‘Izbit Shofah village, east of Tulkarm. They searched Palestinian civilians’ vehicles, checked the passengers’ IDs and then arrested Mujahed Naser Mahmoud al-Khatib, from Tulkarm. At approximately 12:50 on Sunday, 13 May 2018, Israeli forces stationed at Qalandia checkpoint, north of occupied Jerusalem, arrested Majdi Mostafa Kulab (29), from Nablus. The Israeli forces claimed that they found a knife with Majdi and he was intending to carry out a stabbing attack. At approximately 06:00 on Monday, 14 May 2018, Israeli forces stationed at Qalandia checkpoint, north of occupied Jerusalem, arrested Thaier Muneer Abed al-Qader Bani Muniyah (26), from ‘Aqrabah village, southeast of Nablus. Thaier was arrested in spite of having a permit that allows him to pass through the crossing and heading to his work. According to PCHR’s investigations and eyewitnesses’ statement, dozens of Palestinian young men from occupied East Jerusalem responded to calls for protecting Muslims graves in Bab al-Rahma Cemetery adjacent to al-Aqsa Mosque from the eastern side, and gathered at its entrance in spite of transferring it to a military zone by the Israeli forces. The Israeli forces closed the cemetery entrances and forcibly expelled the Palestinian civilians from the cemetery after beating them. 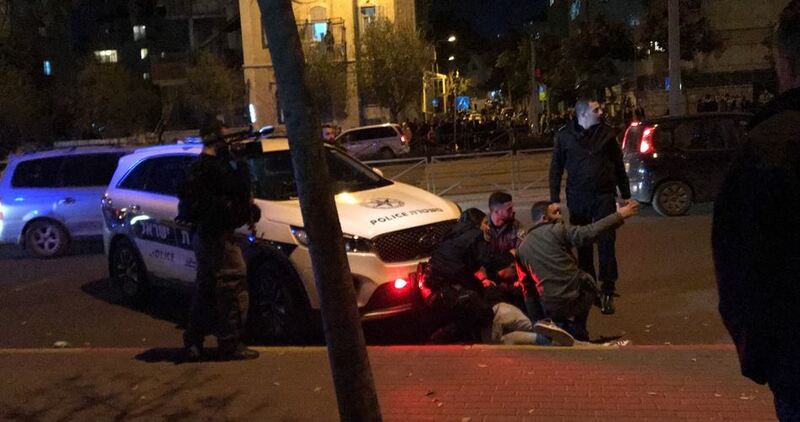 The Israeli soldiers also forced the protesters to walk towards Silwan village, prevented them from passing through al-Maghariba Gate, and attacked them while walking on al-Turbah Street and at the village entrance. While the Israeli forces were suppressing the sit-in in the cemetery, many Palestinian young men and elderlies were wounded as 3 young men sustained sound bomb shrapnel wounds, including one directly hit to the face, and 2 other civilian were hit with rubber bullets. Moreover, 6 protesters were arrested after severely beating them. Those protesters were identified as ‘Emad al-‘Abasi (28), Mahdi Qara’qeen (27), Tareq al-‘Abasi (26), Husam Hamodah (25), ‘Emad al-Qaisy (45), and Mostafa ‘Awad (28). Furthermore, the Israeli forces intentionally attacked press crews by beating and pushing them in addition to forcibly keeping them away from the sit-in in the Bab al-Rahmah Cemtrey. The Israeli forces fired rubber bullets and tear gas canisters at the press crews in order to obstruct their work. The Israeli forces also prevented them from taking photos and denied them access to the scene. The soldiers then chased the press crews and took photos of them. 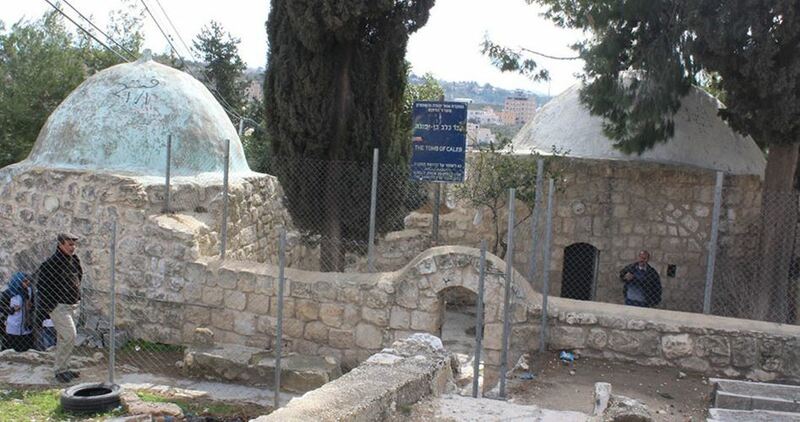 It should be noted that the Israeli authorities have been attempting for years to confiscate parts of the cemetery in order to establish the “National Parks” project in the vicinity of the Old City. Within this project, the Israeli authorities built a path for Israeli settlers and tourists on the cemetery lands and prevented the burial in parts of it. It also cut part of it to build a street known as the “Turbah Street”. During the past days, the Israeli authorities attempted to set up steel fences in the vicinity of and on the graves. The Nature Authority and Municipality claim that the cemetery and hill lands are classified as “a national park and public open yards.” Under an organizational plan in the late 1990s, the classification of the land as “an Islamic Cemetery” was cancelled and the land has become an alienable property while all evidence and documents confirm that the cemetery is registered in (Tabu) in the name of Islamic endowments (Awqaf) and Husseini and Ansari lands. Moreover, the cemetery has been a property belonging to the Ministry of Endowment upon a decision by the Shari’a Court in Jerusalem since the 19th century. It is noteworthy that the alleged temple organizations called on its supporters to extensively participate in the mass and intensive raids of the Al-Aqsa Mosque, coinciding with the commemoration of occupying the city (according to the Hebrew calendar). These organizations published on social media leaflets calling on settlers to raid the al-Aqsa Mosque in groups commemorating the so-called Jerusalem Day. The organizations also called on the settlers in the leaflets to achieve Record numbers this year through the number of settlers, who raid the mosque. In the afternoon, thousands of Israeli people participated in the annual “Flag Dance March” amid tight security measures that isolated the Old City, several neighborhoods and streets of the city to secure the demonstration. The Israeli settlers started their demonstrations from the West Jerusalem streets, passing through al-Khalil and al-Jadeed Gates and then to the Old City shops and neighborhoods via al-‘Amoud Gate, reaching al-Buraq Wall. A group of them were walking towards al-Sahira Gate, Sultan Suleiman Street, and al-Asbat Gate, passing through Silwan village and reaching the Buraq wall, where the rituals and celebrations of the so-called “Day of Jerusalem Unification” were held. During the demonstration, the participants raised Israeli and American flags and banners of the alleged temple, in addition to dancing and singing in circles. They also cursed the Arabs, Palestinians, and Prophet Muhammad and tried to harass the press crews by provocatively raising the flags in front of their cameras or standing in front of them. Medical Aid for Palestinians (MAP) is greatly saddened by the high loss of life and further mass casualties in Gaza this week and outraged that the safety of medical workers in Gaza was once again endangered as they carried out their vital humanitarian functions. Monday 14 May was the deadliest day in Gaza since 2014. According to the Ministry of Health, 60 Palestinians were killed, including eight children and one health worker, and 2,771 injured after the use of live ammunition, rubber bullets and tear gas by Israeli forces targeting demonstrators. Of those hospitalised, 1359 suffered gunshot wounds. Medical teams in Gaza also came under attack. Paramedic Musa Abuhassanin was fatally shot in the chest and 18 health personnel were injured, including Canadian-Palestinian doctor Tarek Loubani who was shot in both legs. Seven ambulances were damaged after they were targeted with tear gas canisters. The following day, on the 70 anniversary of the Nakba, two Palestinians were reported to have been killed by Israeli forces in Gaza, and 417 injured. Multiple demonstrations also took place today across the West Bank, in commemoration of the Nakba. Initial figures from UN OCHA indicate that at least 166 Palestinians, including four children, were injured. Since the Great March of Return demonstrations began on 30 March, at least 102 Palestinians, including 12 children, have been killed by Israeli forces during the course of the protests and more than 12,271 injured. 6,760 Palestinians have been hospitalised, including 3,598 (53 %) by live ammunition. More Palestinians have been injured in the demonstrations (12,271) than during Israel’s 51-day military offensive on Gaza in 2014 (11,231). On Monday 14 May one Israeli soldier was lightly wounded and taken to hospital for treatment, the first Israeli casualty reported to date. There does not appear to have been any threat to them or to others that could have justified the widespread use of lethal and other excessive force. “Our UK programme director and senior surgeons, here as part of an orthoplastic team, have all been in conflict zones before, but they say they have never seen injuries on the scale they saw yesterday [Monday 14 May]. Ambulances, triage areas, emergency rooms and theatres were all full. MAP is responding directly to help local teams treat the injured through the provision of essential medical supplies including medicines, disposables and equipment for orthopaedic surgery. We also supported three medics, orthopaedic surgeon Graeme Groom, consultant plastic surgeon Tom Potokar and plastic and reconstructive surgeon Ghassan Abu Sitta, who were in Gaza this week working alongside local teams to treat the large number of complex limb injuries as a result of the use of live fire. We have been overwhelmed by the generosity of supporters who have made our rapid response possible. Thank you. 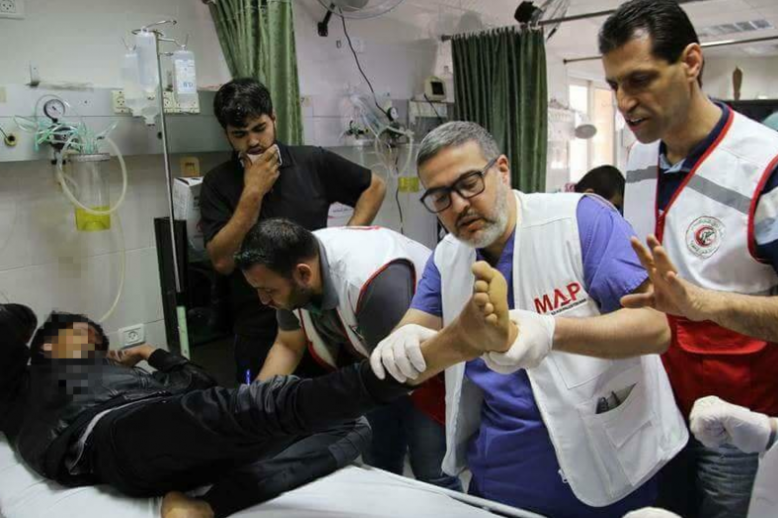 MAP’s team in Gaza have reported that the health system is near breaking point after receiving so many devastating and disabling injuries. Chronic shortages in medicines and disposables have spiked in recent months and are particularly acute for cancer, cardiac and dialysis patients. In addition, hospitals suffer from severe shortages of fuel to keep generators running and services open and are functioning on just four or five hours of mains supply of electricity a day. At a press conference at Al Shifa Hospital, the Ministry of Health called for international support to prevent the complete collapse of the healthcare system in Gaza. The blockade of almost 2 million people in Gaza has been labelled “collective punishment” by the UN Secretary General, the UN Special Rapporteur on human rights in the occupied Palestinian territory and by the International Committee of the Red Cross. Collective punishment is prohibited under international law. 11 years of closure, three major offensives by Israeli armed forces, 51 years of occupation and chronic fuel shortages have together pushed Gaza to the brink of being an “unliveable” environment, as the UN warned several years ago. A Syrian Coalition official said that the Assad regime and its allies continued to violate the ‘de-escalation zones’ agreements that was reached in Astana and commit widespread war crimes against civilians. He stressed the need to release the detainees, allow the introduction of humanitarian aid, and allow the return of displaced persons to their homes. Farhan underscored that ensuring protection for millions of Syrians in Idlib province, rural Aleppo, and the southern region was the primary goal of the delegation of the revolution to the ninth round of talks in Astana. He noted that the opposition delegation succeeded in securing guarantees that the Assad regime and Iran will not be allowed to try to recapture or bomb these areas. Farhan pointed out that the delegation of the armed opposition presented a memorandum to Russia and the United Nations in which it made it clear that reaching side agreements in northern rural Homs and eastern Ghouta, which are covered by the ‘de-escalation zones’ agreement according to Article 1 of the Memorandum of Understanding that was concluded by the guarantors in Astana on May 4 2017, represented blatant violation of the agreement. He warned that such unilateral agreements risked damaging the credibility of the ‘de-escalation zones’ agreement in front of the Syrian people and the international community as well as threatened its total collapse along with all the understandings surrounding it. Moreover, Farhan noted that these unilateral agreements had led to mass forced displacement of civilians, which reflected negatively on the chances of the success of negotiations and reaching a political solution in Syria. These unilateral agreements also amounted to war crimes under Articles 6, 7 and 8 of the Rome Statute, Article 49 of the Fourth Geneva Convention, and article 2 of the UN Convention on the Prevention and Punishment of the Crime of Genocide. Farhan also pointed out that the armed opposition’s memorandum stressed that a political transition in accordance with the Geneva Communique of 2012 and UN Security Council resolutions 2118 and 2254 is the only solution that can guarantee the return of millions of displaced persons, prevent the return of terrorism, and restore peace and stability. All attempts to find a political settlement cannot win credibility or succeed unless detainees are released, humanitarian access is allowed, the displaced persons are allowed to return to their homes, and violations are stopped. Furthermore, Farhan said that the delegation of the armed opposition warned that violations in the areas covered by the ‘de-escalation zones’ agreement as well as the failure to achieve a tangible progress in the issue of detainees would have serious repercussions on the whole Astana track and its credibility. The memorandum called for the release of detainees, forcing the Assad regime to stop arbitrary detentions, assassinations, and torture of detainees as well as giving independent observers unfettered access to prisons and detentions centers to ensure that detainees are receiving human treatment. Moreover, the memorandum called for forcing the Assad regime and its allies to abide by the ‘de-escalation zone’ agreement and immediately stop all air and ground attacks against the areas covered by the agreement. It also called for the re-inclusion of the evacuation deal at was reached under the force of arms in northern rural Homs into the Astana Agreement to ensure the safe return of the people who were forcibly displaced from the area. Farhan concluded his remarks by adding that the memorandum also stressed the need to establish monitoring and accountability mechanisms in order to ensure the implementation of a comprehensive ceasefire and prevent any further violations. The Hebrew Bible (Tanakh) is for the committed Jew as much a record of his ancient origins, the prism through which all Jewish history is interpreted (is not the “Holocaust” a biblical term? ), and the unalterable pattern of Israel’s promising future. That is why the Bible, once the “portable fatherland” of the Diaspora Jews as Heinrich Heine put it, remains at the core of the national narrative of the Jewish State, whose founding fathers did not give it any other Constitution. It is true that the earliest prophets of political Zionism — Moses Hess (Rome and Jerusalem, 1862), Leon Pinsker (Auto-Emancipation, 1882) and Theodor Herzl (The Jewish State, 1896) — did not draw their inspiration from the Bible, but rather from the great nationalist spirit that swept through Europe at the end of the 19th century. Pinsker and Herzl actually cared little whether the Jews colonized Palestine or any other region of the globe; the first thought about some land in North America, while the second contemplated Argentina and later Uganda. More important still than nationalism, what drove these intellectual pioneers was the persistence of Judeophobia or anti-Semitism: Pinsker, who was from Odessa, converted during the pogroms that followed the assassination of Alexander II; Herzl, at the height of the Dreyfus affair. Nevertheless, by naming his movement “Zionism,” Herzl himself was plugging it into biblical mythology: Zion is a name used for Jerusalem by biblical prophets. And after Herzl, the founders of the Yishuv (Jewish communities settled in Palestine before 1947) and later of the Jewish State were steeped in the Bible. From their point of view, Zionism was the logical and necessary end of biblical Yahwism. For Ben-Gurion, Kurzman writes, the rebirth of Israel in 1948 “paralleled the Exodus from Egypt, the conquest of the land by Joshua, the Maccabean revolt.” Yet Ben-Gurion had never been to the synagogue, and ate pork for breakfast. “unconsciously believed he was blessed with a spark from Joshua’s soul.” “There can be no worthwhile political or military education about Israel without profound knowledge of the Bible,” he used to say. Ben-Gurion’s attachment to the Bible was shared by almost every Zionist leader of his generation and the next. Moshe Dayan, the military hero of the 1967 Six Day War, wrote a book entitled Living with the Bible (1978) in which he justified the annexation of new territory by the Bible. More recently, Israeli Education minister Naftali Bennett, a proponent of full-scale annexation of the West Bank, did the same. The paradox is only apparent, because for Zionists, the Bible is not a religious text, but a textbook of history. And so it should be obvious to anybody paying attention that Israel’s behavior on the international scene cannot be understood without a deep inquiry into the Bible’s underlying ideology. Only by taking account of the biblical roots of Zionism can one understand why Zionism has never been a nationalist movement like others. It could not be, as Gilad Atzmon remarked, from the moment it defined itself as a Jewish movement, aimed at creating a “Jewish state”. Jewish exceptionalism is a biblical concept that has no equivalent in any other ethnic or religious culture. Christians find hope in Isaiah that, some day, all peoples “will hammer their swords into plowshares and their spears into sickles. Nations will not lift sword against nation, no longer will they learn how to make war” (Isaiah 2:4). The launching of the Iraq War was a decisive step toward that goal of a new world order headquartered in Jerusalem. It was the context for a “Jerusalem Summit” held in October 2003 in the highly symbolic King David Hotel, to seal an alliance between Jewish and Christian Zionists. Three acting Israeli ministers spoke at the summit, including Benjamin Netanyahu. Richard Perle, the guest of honor, received on this occasion the Henry Scoop Jackson Award. When Israeli leaders claim that their vision of the global future is based on the (Hebrew) Bible, we should take them seriously and study the Bible. It might help, for example, to know that according to Deuteronomy Yahweh plans to deliver to Israel “seven nations greater and mightier than [it],” adding: “you must utterly destroy them; you shall make no covenant with them, and show no mercy to them. You shall not make marriages with them…” (7:1-2). As for the kings of these seven nations, “you shall make their name perish from under heaven” (7:24). The destruction of the “Seven Nations,” also mentioned in Joshua 24:11, is considered a mitzvah in rabbinic Judaism, included by the great Maimonides in his Book of Commandments, and it has remained a popular motif in Jewish culture, known to every Israeli school child. In his September 20, 2001 speech, President Bush also targeted seven “rogue states”, but included Cuba and North Korea instead of Lebanon and Somalia. The likely explanation to that discrepancy is that Bush or his entourage refused to include Lebanon and Somalia, but that the number seven was retained for its symbolic value, as an encrypted signature. Without question, the neocons who were writing Bush’s war agenda were Zionists of the most fanatical and Machiavellian kind. But the neocon viper’s nest is not the only place to look for crypto-Zionists infiltrated in the highest spheres of US foreign and military affairs. Consider, for example, that Wesley Clark is the son of Benjamin Jacob Kanne and the proud descendant of a lineage of rabbis. It is hard to believe that he never heard about the Bible’s “seven nations”? Is Clark himself, together with the Amy Goodmans who interviewed him, trying to write history in biblical terms, while blaming these wars on the Pentagon’s warmongers? What’s going on, here? “Yahweh roused the spirit of Cyrus king of Persia to issue a proclamation and to have it publicly displayed throughout his kingdom: ‘Cyrus king of Persia says this, Yahweh, the God of heaven, has given me all the kingdoms of the earth and has appointed me to build him a temple in Jerusalem, in Judah.’” (Ezra 1:1-2). For acting on behalf of Yahweh, Cyrus is bestowed the title of God’s “Anointed” (Mashiah) in Isaiah 45:1. A succeeding Persian emperor, Darius, confirmed Cyrus’ edict, authorizing the rebuilding of the Temple, and ordering gigantic burnt offerings financed by “the royal revenue.” Anyone resisting the new theocratic power backed by Persia, “a beam is to be torn from his house, he is to be impaled on it and his house is to be reduced to a rubbish-heap for his offense” (Ezra 6:11). Then another Persian king, Artaxerxes, is supposed to have granted Ezra authority to lead “all members of the people of Israel in my kingdom, including their priests and Levites, who freely choose to go to Jerusalem,” and to rule over “the whole people of Trans-Euphrates [district encompassing all territories West to the Euphrates]” (7:11-26). In 458 BCE, the priest Ezra went from Babylon to Jerusalem, accompanied by some 1,500 followers. Carrying with him the newly redacted Torah, Ezra called himself the “Secretary of the Law of the God of heaven” (7:21). He was soon joined by Nehemiah, a Persian court official of Judean origin. The edicts of Cyrus, Darius and Artaxerxes are fake. No historian believe them authentic. But the fact that Persian kings granted to a clan of wealthy Levites legal authority for establishing a theocratic semi-autonomous state in Palestine seems historical. What did these proto-Zionists give the Persian kings in return? The Bible does not say, but historians believe that the Judeans exiles in Babylon had won the favor of the Persians by conspiring to help them conquer the city. What is of interest in this biblical narrative is the blueprint for the Zionist strategy of influencing the Empire’s foreign policy for its own advantage. In the late 19th century, the empire was British. Its foreign policy in the Middle East was largely shaped by Prime Minister Benjamin Disraeli. Born in a family of Marranos converted back to Judaism in Venice, Disraeli can be considered a forerunner of Zionism, since, well before Theodor Herzl, he tried to include the “restoration of Israel” in the Berlin Congress’ agenda, and hoped to convince the Ottoman Sultan to concede to Palestine as an autonomous Jewish province. A quarter of a century after Disraeli, Theodor Herzl also failed to convince the Sultan. It therefore became necessary that the Ottoman Empire disappear and the cards be redistributed. Zionists then played the British against the Ottomans and, by means now well-documented, obtained from the former the Balfour Declaration (in fact a mere letter addressed by Secretary of State Arthur Balfour to Lord Lionel Walter Rothschild). But when the British started to limit Jewish immigration in Palestine in the 1930s, the Zionists turned to the rising new Imperial power: the United States. Today, the stranglehold of Zionists on US imperial policy is such that a few Jewish neocons can pull the US into a series of wars against Israel’s enemies with a single false flag attack. The capacity of Israel to hijack the Empire’s foreign and military policy requires that a substantial Jewish elite remain in the US. Even Israel’s survival is entirely dependent on the influence of the Zionist power complex in the United States (euphemistically called the “pro-Israel lobby”). That is also a lesson learnt from Ezra and Nehemiah’s time: Nehemiah himself retained his principal residence in Babylone and, for centuries after, the kingdom of Israel was virtually ruled by the Babylonian exiles. In the words of the Zionists themselves, including Herzl himself, Zionism was supposed to be the “final solution” to the Jewish question. In 1947, the whole world hoped that it would be, except for Arab leaders who warned against it. But Israel’s existence has only resulted in changing the “Jewish question” into the “Zionist question”: the question about the true ambitions of Israel. Part of the answer is to be found in the Hebrew Bible. The Zionist question is the Biblical question. Zionists themselves tell us so. Their mouths are full of the Bible. “We’re an ancient people. In our nearly 4,000 years of history, many have tried repeatedly to destroy the Jewish people. Tomorrow night, on the Jewish holiday of Purim, we’ll read the Book of Esther. We’ll read of a powerful Persian viceroy named Haman, who plotted to destroy the Jewish people some 2,500 years ago. Netanyahu managed to schedule his address to the Congress on the eve of Purim, which celebrates the happy end of the Book of Esther — the slaughter of 75,000 Persians, women and children included. This typical speech by the head of the State of Israel is clear indication that the behavior of that nation on the international scene cannot be understood without a deep inquiry into the Bible’s underlying ideology. Such is the main objective of my new book, From Yahweh to Zion: Jealous God, Chosen People, Promised Land … Clash of Civilizations, translated by Kevin Barrett. A horde of extremist Jewish settlers stormed at dawn Friday Kifl Haris town, north of Salfit in the occupied West Bank, and performed rituals at historical sites. According to local sources, settlers aboard three vehicles entered the town at dawn and visited Islamic shrines in the central area. Later, the settlers withdrew to Ariel settlement after spending hours in the area. In a news conference held in Gaza City on Thursday, a spokesperson for the commission called for urgent intervention by the international community and the UN to provide protection for the citizens participating in March of Return rallies in Gaza. The commission also called on the UN secretary-general to set up an independent inquiry into the massacre that was committed last Monday by the Israeli occupation army against unarmed protesters. It also asked Palestinian Authority president Mahmoud Abbas to necessarily issue an edict to file war crimes complaints against Israel with the International Criminal Court. Violent clashes erupted between the Israeli forces and Palestinian youths in Qalqilya and Jerusalem late Friday. Local sources reported that the Israeli police stormed al-Isawiya town in Jerusalem, blocked a number of roads, and heavily fired rubber-coated metal bullets, sound bombs and teargas canisters at the Palestinians citizens. Wadi Hilweh Information Center said that the police arrested two Palestinian youths during the raid. One of them was identified as Mohammed Abu al-Hummus, 27, and he was arrested while injured by a rubber-coated metal bullet. Meanwhile, dozens of Jerusalemites organized a protest in Bab al-Amud area in solidarity with Gaza and in protest at the US embassy transfer to Jerusalem. According to Wafa news agency, limited clashes broke out near al-Sahira Gate and Shu’fat refugee camp. No injuries or arrests were reported. In another context, the Israeli occupation forces arrested a Palestinian minor during overnight confrontations in Qalqilya city. Local sources told the PIC reporter that clashes flared up at the northern entrance to Qalqilya during which the Israeli soldiers heavily fired teargas canisters at the Palestinian citizens causing a number of suffocation cases. The sources said that the soldiers arrested a child and transferred him to an unknown destination before they closed the northern entrance for hours. The Israeli forces further raided Azzun town in Qalqilya at dawn Saturday, closed the main entrance to the town, and deployed a large number of soldiers in the streets. 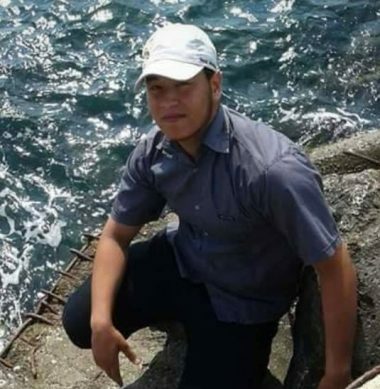 The Palestinian Health Ministry in the Gaza Strip has reported that a young Palestinian man died, Saturday, from serious wounds he suffered on Monday, May 14. It said the young man, identified as Mohammad Mazen Oleyyan, 20, was shot with live Israeli army fire, and died from his serious wounds at the Al-Quds Hospital, in Gaza. The Palestinian was with a live round in the head, during the Great Return March, east of the al-Boreij refugee camp, in central Gaza. He remained in a critical condition, before was pronounced brain dead, and passed away Saturday. On Saturday at dawn, another Palestinian identified as Mo’in ِِAbdul-Hamid Sa’ey, 58 years of age, died from his serious wounds at the Shifa Medical Center in Gaza city, where he was rushed to surgery and then to the Intensive Care Unit until he succumbed to his wounds. On the same day of his serious injury, Israeli soldiers killed 60 Palestinians, including an eight-month-old baby, 6 children and four officers of the Ministry of Interior and National Security, in the Gaza Strip, and injured more than 2700, among them 122 children, and 44 women. 27 of the injured Palestinians suffered very critical wounds, 59 serious injuries, 735 moderate wounds, and 882 suffered light wounds. 772 of the wounded Palestinians were shot with live rounds, three with rubber-coated steel bullets, 91 with shrapnel, 100 cuts and bruises and 737 suffered the effects of teargas inhalation. 65 of the wounded were shot in the head and neck, 116 in their arms, 48 in the chest and back, 651 in the lower extremities, 52 in several parts of their bodies and 737 suffered the effects of teargas inhalation. On Friday, May 18th, the soldiers injured 56 Palestinians, including two journalists and one medic, in several parts of the Gaza Strip. Twenty-three of the wounded Palestinians were shot with live rounds. Their deaths bring the number of Palestinians who were killed since the processions started on Palestinian Land Day, March 30, to 119 while more than 12000 have been injured.